Farm activities in the surrounding areas include: dairy, fruit, vegetables and wine. 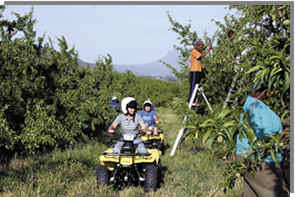 We take you through the vineyards, orchards and paddocks on the quad bikes. When in season you can pick and eat fruit from the quad bike.